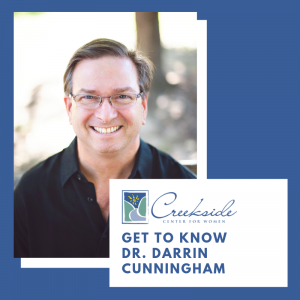 Dr. Darrin Cunningham completed his medical degree at Oklahoma State University College of Osteopathic Medicine in 1991, subsequently completing an Obstetrics & Gynecologic Surgery internship and residency in 1996 at Hillcrest Health Center in Oklahoma City, Oklahoma. Dr. Cunningham is Board Certified in Obstetrics & Gynecologic Surgery. Why did you decide to study Obstetrics & Gynecology? I was initially going to do family practice with an obstetrics emphasis, but then I discovered surgery and found not only an aptitude but a love for minimally invasive surgery. I am thankful that in my job I can help relieve pain and suffering for my patients, in addition to caring for the prenatal and other health needs of my patients. What have been some of the most rewarding aspects of working in OBGYN? The most obvious reward is delivering babies. It’s simply a miracle every time you see a new baby, even when everyone is exhausted at 2 AM. Seeing the look on the mom’s and the family’s faces as they look at their little one is so joyful and astonishing with every baby born. Perhaps the most challenging is working with a family who has had a loss, perhaps a miscarriage. It’s always hard to walk with a family through that experience. I’ve had the privilege of counseling families that have experienced a loss. They are nervous, and we talk through their emotions and concerns, helping them to the end. It’s an incredibly great experience to be part of when they do have a baby. What’s a typical work week like for you? I’m in the clinic every day, Monday through Friday. Some of those days are blocked out for surgeries. I’m also on call one night a week and every fifth weekend. We’re one of the few clinics where we don’t rotate our patients, and the doctor will deliver his or her own patients’ babies if possible. Now, if a woman goes into delivery at night, she might get a different doctor. The call system allows the medical team to be able to have a family life. However, if I know one of my patients is delivering in the evening, I will do my best to stay, (if my wife says it is okay). What types of care, education, and support do you provide women before pregnancy? If a woman hasn’t had a well-woman exam, I will conduct a physical exam including a pap smear and conduct screenings for breast and gynecologic cancers. I will discuss her health situation and lifestyle behaviors. I’ll meet with her (and her partner) once a month until 28 weeks, and then every two weeks until week 36, and then once a week. I’ll continue to discuss her health and answer questions as well as check for high blood pressure, gestational diabetes, preeclampsia, and such. What types of care, education, and support do you provide women after pregnancy? I see my patients approximately four weeks after delivery to make sure everything is going well, to discuss birth control, and to make sure they’re healing well, for example. Doing this gives us time to plan procedures like tubal ligations, so they are within their medical insurance coverage timeframe. I offer a very personalized, family-oriented care. I intentionally don’t have a computer in my room, because I want to listen to the person who I’m with, to genuinely hear their story. It’s essential that women get individualized, focused attention from their doctor. My family, my wife (married since 1992) and our son, are very water-oriented. Sometimes my family and I will rent a sailboat in the Caribbean and sail with friends. When we aren’t swimming, then we scuba dive as a family. We also boat on Grand Lake in Oklahoma since my in-laws live there. Do you have any additional career goals that you are working toward right now? I’m always learning something new, and I do my best to stay up on technology and advances in the field of OBGYN through reading journal articles on best practices and attending conferences. In early 2018, I completed training in the use of the da Vinci Surgical System as a Console Surgeon. Can you summarize your philosophy of practice? I’ve always said that I want to treat my patients the way that I want my wife’s doctor to treat her.